As Northland Family Help Center begins to prepare for our 40th holiday season, we are also preparing for our 3rdannual Adopt-A-Family program. Many of our clients experience financial burdens after crime victimization especially those that have experienced Domestic Violence. Our clients typically have one or more jobs, are single parents, have recently experienced a divorce or trauma, and/or live on fixed incomes. Our clients are generous and caring and it is so hard for them to ask for this kind of help. Every year we see first-hand how economic barriers can lead some of our clients into depression during the holiday season because they can’t give their children the Christmas presents they have asked for. But, with your help we can change that! From there Heather will send you family stories and wish lists for this holiday season and you can pick the family or individual whose needs speak to your heart. Thank you and Happy Holidays! 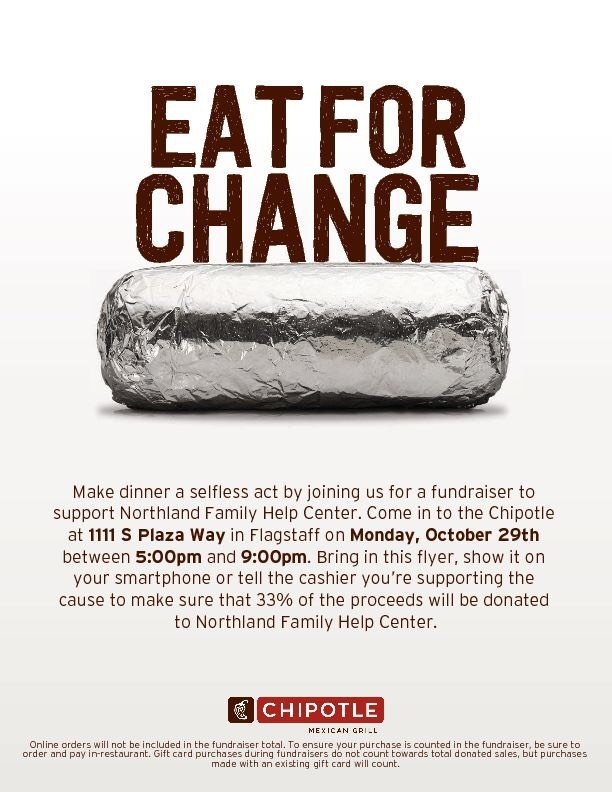 Please join us 10/29/18 from 5-9p at Chipotle in Flagstaff. They are generously donating 33% of all sales during that time to NFHC. Please tell the cashier you are supporting NFHC or show this flyer via print or from your phone. Thanks! There are still two Sundays left to take time for self-care and benefit the Flagstaff Initiative Against Trafficking, housed at NFHC! Why gift cards? 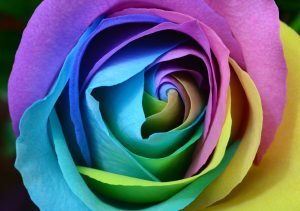 Last year, a young 16 year old girl faced the passing of her mother after endearing a difficult illness. Her school had received gift cards from the 2016 CCC&Y drive, and she was offered assistance. She was so excited to have money to purchase clothing and food for her and her cousins from Walmart. She cried and told school staff that no one had ever asked her what she needed in her entire 16 years on this earth. 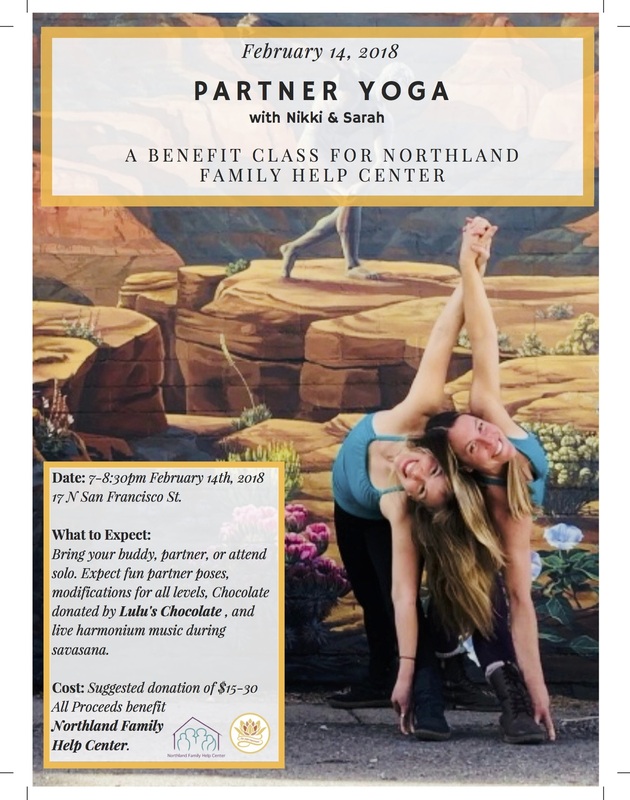 All proceeds will be used in Coconino County to obtain gift cards that will benefit the local youth shelter/outreach program at Northland Family Help Center and various school districts’ McKinney–Vento homeless youth programs where cards will be used for homeless and runaway youth facing tremendous challenges. Use this link to donate electronically or gift card, cash and check donations can be given/mailed at the below address. As Northland Family Help Center begins to prepare for our 39th holiday season, we are also preparing for our 2nd annual Adopt-A-Family program. From there Heather will send you family stories and wishlists for this holiday season and you can pick the family or individual whose needs speak to you. Thank you and Happy Holidays! Stop by Shoes & Such to support NFHC’s 2nd Annual School Supply Drive July 7-31st! Many children at the shelter need your help purchasing their school supplies. Come down and take a leaf with a few school supplies that you can purchase. Buy the supplies and return them to Shoes & Such by July 31st. It’s just like the Giving Tree around Christmas, but this Giving Tree is to support the children’s’ education. As the supplies get returned the leaves will be displayed to show the community that together we can support the children in starting their school year off right! Thank you! Individuals with disabilities may request reasonable accommodations with 72 hours prior notice. Alternative formats are offered. The Qwest TDD relay number is 800-223-3131. Computer use can be monitored and is impossible to completely clear. If you are afraid your internet and/or computer usage might be monitored, please use a safer computer, and/or call 911 or the U.S. National Domestic Violence Hotline at 1-800-799-7233 or TTY 1-800-787-3224. Copyright © 2014 Northland Family Help Center. 501(c)3 non-profit organization. All Rights Reserved.